So, I've been mulling over this post for a couple of weeks, ever since I bought the new Decemberists album, “The Hazards of Love”. I suppose you could label it something of an "indie rock opera". But, after a couple of weeks with it, I personally would label it "The Best Album of 2009". The plot is a bit bizarre, about a woman Margaret, her forest-spirit lover William, the Queen of the forest, and a murderous rake, and it's a bit of a far-out story. The idea of having an album that isn't just a collection of singles is bit out there for these times. And, mark my words, this is not an album full of singles. By themselves, these songs are good, but none of them is great. However, as a whole, the album is amazing. I've listened to it at least five times in the last two weeks, and it really is awesome to listen to straight through. Musically, this album clearly borrows from a lot of past genres. The second track, The Hazards of Love 1 (The Prettiest Whistles Won't Wrestle the Thistles Undone) reminds me pretty strongly of some Pentangle tracks. The prominent acoustic bass line at about 1:15 into the song could easily fit in with Market Song, Haitian Fight Song, or something else off of “Sweet Child”. Then there's track 10, The Rake's Song, which is one of the songs from this album that might stand alone as a single. Heavy fuzz-bass, a fairly simple acoustic guitar line, and the powerful voice of Colin Meloy give this song a folk-rock-ish feel. The lyrics make it disturbingly memorable. Let's see, what else? I suppose that no review of this album would be complete without talking about The Queen's Rebuke/The Crossing. The instrumentals on this song provide such a powerful wall of sound that it almost elicits comparisons with Led Zeppelin, Pink Floyd, or some other 70's heavy-rock band. Shara Worden's vocals on this song remind me a bit of Sandy Denny in Fairport Convention, but with a darker twang. Track 15, The Hazards of Love 3 (Revenge! ), is a bit of an oddity. It opens with the main Hazards of Love/The Wanting Comes in Waves melody, then abruptly transitions to a harpsichord and vaguely chromatic childrens' voices. Combine this with screeching strings and chopped synthesizers, and it's a seriously creepy song. Which is appropriate, I suppose, for a song about the ghosts of murdered children coming back to take revenge via patricide. The album ends on a completely different tone, of course. 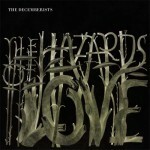 The Hazards of Love 4 (The Drowned) has laid-back New Wave-y rhythms with a melody that could almost be... country? Or maybe that's just the pedal steel guitar giving me that impression. It's a completely different style than the rest of the album, anyway. But it's still excellent, and, having heard it, I couldn't picture the album ending any other way. Just from these tracks, you can see that this album charts an enormous amount of musical space. I'm sure that it won't be for everybody. But, well, it has my recommendation.